I suggest that you print out this recipe immediately, go to your kitchen, get these prepped up and pop them in the fridge to rise overnight. Then when you wake up in the morning, bake them and eat a delicious caramel pecan roll to start out your Monday on a good foot. I found this recipe on the Betty Crocker website a while ago and wrote it down, knowing I needed to make it ASAP. Well, I waited a few months and let me tell you, I won't be waiting that long to make these again! 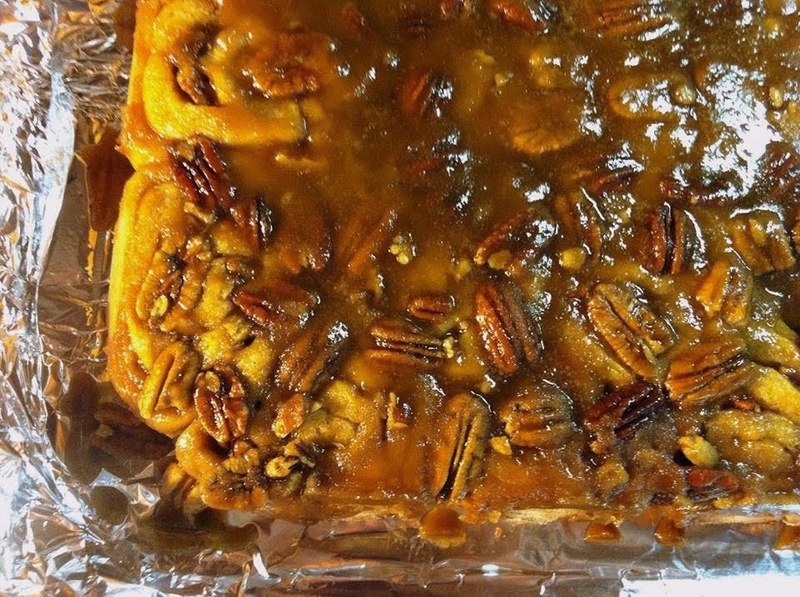 I do love my Grandma's Sticky Buns recipe, which I have posted before. Those are difficult to beat and I have a soft spot for them since they are what I was raised with. But, those require a lot of dipping in the melted butter and rolling in the cinnamon/sugar so it gets messy. Not that I don't mind that...because I don't at all. Those are my favorite. 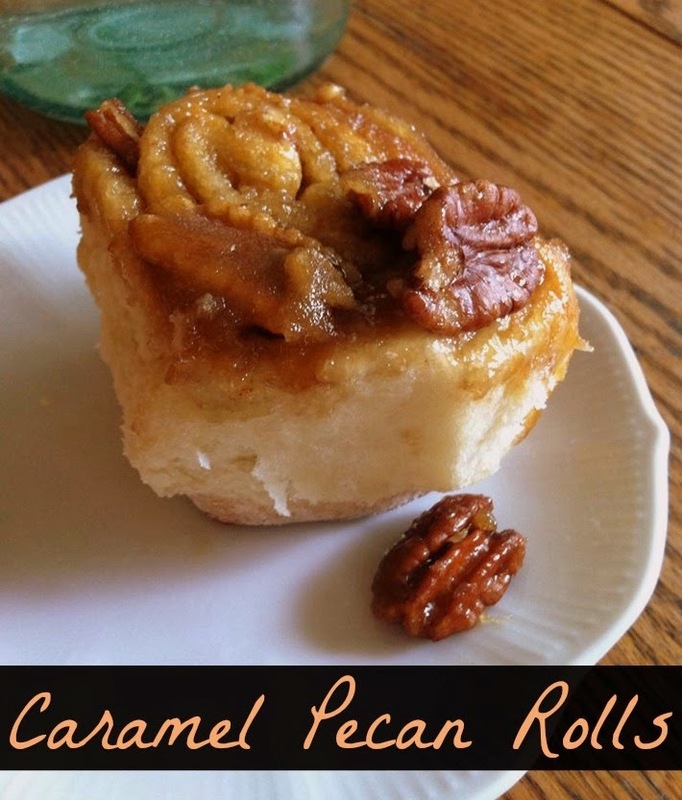 Your basic cinnamon rolls amped up with a caramel glaze instead of an icing and those wonderful pecans inside and out. I am working hard at losing weight now also. Then when I made these I literally thought, "what in the bleep am I thinking making these because I will eat them all." Close. I ate close to all. Please don't tell. I still lost weight though. Thank goodness for the heat and sweating off all that sugar while gardening and getting the kid pool set up. I sweat a lot after enjoying these. You can bake these without letting them rise all night long in the refrigerator, just let them rise in a warm place for 30 minutes before baking. I did modify the recipe slightly, hardly at all. They'll still perfect! In a large mixing bowl, combine 2 cups of the flour, the sugar, salt and yeast. Add the warm milk, the 1/3 cup butter and the egg. Beat using a dough hook for about a minute, scraping sides of bowl as needed. Stir in as much of the remaining flour as you can, a little at a time, until the dough is easy to handle. On a lightly floured surface roll out the dough and coat all sides. Knead the dough for about five minutes until smooth and elastic. Place in a greased bowl, rolling the dough on all sides to coat with grease entirely. Cover and let rise in a warm area for 1 1/2 hours, or until it has doubled. In a small saucepan, heat the 1 cup brown sugar and 1/2 cup butter until boiling, stirring constantly. Stir in the corn syrup. Let stand about 5 minutes then pour evenly into the pan. Sprinkle with the pecan halves. In a small mixing bowl, mix together the brown sugar and cinnamon; set aside. On a floured surface, roll out the dough into a 15x10 inch rectangle. Spread with the 1/4 cup butter, (I use my fingers). Sprinkle with the brown sugar and cinnamon mixture, then sprinkle the chopped pecans evenly over the dough. Roll up tightly, beginning on a long side. Pinch the seam of the dough to seal it. Stretch the dough as needed to make as even as possible. Slice into 16 even slices. Cover the unbaked rolls tightly and place in the refrigerator for at least 12 hours to rise, otherwise set in a warm place for 30 minutes before baking, if wanting immediately. Bake, uncovered for 30-35 minutes or until golden brown. Immediately either cover with foil and invert onto a flat cookie sheet, or just invert onto a plate. Let the pan rest over the rolls for a few minutes to allow the caramel to coat the rolls.